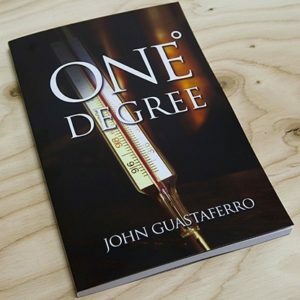 Announcing the new softcover edition of One Degree. This 140-page book contains over 20+ professional card routines, including both unpublished and updated effects from John’s repertoire. One Degree takes a deep look into how to make our magic stronger through small, yet important “one degree” improvements. Just as changing the temperature of water from 211 degrees to 212 degrees can take it to the boiling point, making “one degree” changes in our magic can take it to the next level. Beyond the routines, there are five insightful essays that will make your magic stronger in every way. 1. TRUTH IN ADVERTISING – A masterfully constructed “blank” deck opener. 2. EITHER OR – A fun Q&A session brings smiles to the room -and a devious setup. 3. PALM READER PLUS – Four cards amazingly change in your helper’s palm. 4. INTRO-VERTED – This impromptu Ace production was among 2009′s top ten effects from MAGIC magazine. Includes an must-see variations: Extra-verted and Technicolor Intro-Verted. 5. MR. E. TAKES A STROLL – A strolling version of Jack Carpenter’s Mysterious. 6. RELAY – A fun and seemingly impossible revelation of three cards. 7. QUANTUM KINGS – A devious card to box opener. 8. IMPOSTOR – A dazzling four-card change sequence. 9. SOLO – In this approach to Open Travelers, the cards never come near the deck. 10. HOMAGE TO HOMING – A powerful, three-phase card to pocket routine. 11. POCKET CHANGE – A four-card pocket transposition with a surprising twist. 12. KEY CLUB – A quick mental effect you carry with you on your keychain. 13. OVERTURNED COUNTS – New approaches to the Elmsley and Stanyon Counts. 14. BIDDLELESS – A smart, lean and razor-sharp take on The Biddle Trick. 15. DUPLEX CHANGE – John’s deceptive two-card change. Includes many applications. 16. BEHIND THE BACK TRIUMPH – Your participant unmixes the cards…behind their back! 17. BALLET STUNNER – John’s take on Paul Harris’ Color Stunner with a visual change and unexpected kicker. 18. LOST & FOUND – A signed card vanishes AND reappears inside a clear plastic luggage tag. 19. INTUITION and OUT OF THE BLUE – Many magicians call this two-phase packet effect the best trick of its kind…ever! 20. VINO ACES – A true presentation piece using four wine glasses for a classic Ace Assembly.